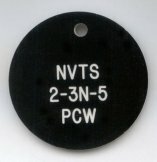 Whatever your need, we can do engraved plastic disks to your specifications. You select the color, you determine the text, and we'll do the work. Holes? No problem. One or two? Just let us know what size you want it/them. Text on both sides? Of course - but only if you want. We engrave to your specifications! Our most popular sizes are 1", 1 1/2", 2", 3", and 4" but you get to choose. Color? Check here for the many options. We know that products like these are often the last thing you think about. That's why you'll appreciate our quick and efficient service. Fax us your order and in two business days, it will be on its way to you. One item or a thousand: we'll make sure you get your order on time and done right. Repeat orders - No problem! Once we've done a round tag for you, we'll retain your specifications so future orders will be done the same way. Fax us your information today. We'll give you a quote that you'll find appealing - along with our 100% satisfaction guarantee. Have a regular engraver? Feel free to send us one or two items: you'll see the difference in our responsiveness. Next time your regular supplier can't deliver, you'll know where to turn - and we'll know what you want. Many Fire Departments use a 'tag board' for that extra level of safety for their (OUR!) firefighters. 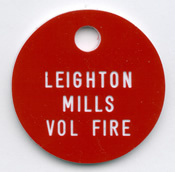 We've done LOTS of these tags so whether you're just starting and need a set for your entire department or if you need just one tag for that new department member, we can do them fast and to your specifications. You'll find our prices are affordable and will be easy on your budget. 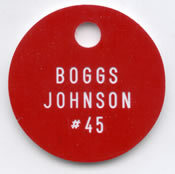 We save the specifications for your job on our engraving machines so when you reorder, your new tags will match everyone else's. 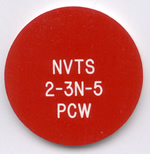 In addition, we'll give you our quick turn-around so you'll have those tags for the next call or training session. This is a job we take pride in doing - and we appreciate all that our firefighters do for us! The above samples show front/back in a requested format. We'll engrave these to YOUR specifications. 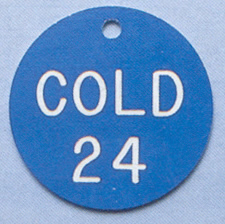 Were you looking for Pendant Tags? Click HERE!